The Indian Sand Boa is the largest Sand Boa, occasionally reaching over 4 feet in length. They are slenderer than the Rough-scaled Sand Boa. Adults are uniform brown in color, varying from tan to dark blackish brown. 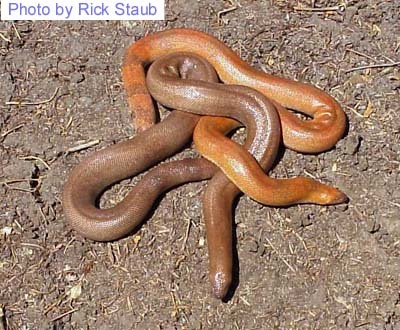 Some adults can retain the orange coloration of neonates, as seen in the male in the above picture. Babies, however, are orange with black bands (this photograph is of a two month old baby). As they age, the orange fades and the body takes on its dark brown coloration. During this change they can be brown with scattered specks of orange, often with faint dark bands. Adults of the western subspecies (E. j. persicus - represented in the top photograph) retain the juvenile banding on the tail. The tail is very blunt and shaped like the head. When threatened, an Indian Sand Boa will hide its head and hold its tail up in the air and wave it back and forth. This may also explain the prominence of the banding on the tail of juveniles and adults. The moving banded tail is more likely to be attacked than the concealed head. (This is the same behavior used by other Erycine snakes including the Rubber Boa and the African Burrowing "Python"). As tribute to the effectiveness of this display, many wild caught adults have scarred tails. Indian snake charmers will also disfigure the snakes tail to look more like the head and advertise them to their clients as "two-headed" snakes. Indian Sand Boas occurs throughout the drier areas of India and east through Afghanistan, Pakistan and into southeastern Iran. It occurs on plains and other areas of flat clay soils. Like many of the other Sand Boas, it is not restricted to, nor typical of, sandy soils. 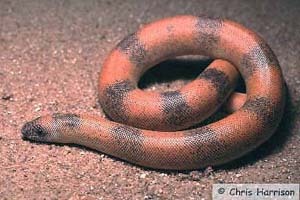 The Indian Sand Boa is becoming increasingly popular in captivity in the United States. This is due not only to the fact that the babies are very attractive, but also to the fact that these are very personable snakes. They stay small and are very docile. They eat greedily in captivity and captive born babies are becoming more and more readily available each year. In the opinion of many Sand Boa keepers, this is the best species of Eryx to start with. They are more docile and predictable than the other species and newborn babies are big enough to take pinkie mice. Unfortunately, because the supply of captive born babies is limited and because the babies are so attractive, they command a higher price than other species. Indian Sand Boas can be maintained in small cages with a secure hide box or a substrate they can burrow into (I suggest aspen shavings). They require a water bowl at all times, but it must be stable enough that the snake cannot tip it over as burrows around the cage. Small dead (weanling) mice are usually readily taken by the adults and juveniles will take large pinkies. There are some reports that this species will feed on other snakes, so they should be housed separately. 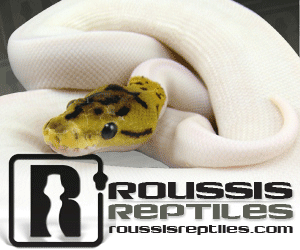 For more information on keeping Sand Boas, see the feeding and housing pages. Daniel, J.C. 1989. The Book of Indian Reptiles. Bombay Natural History Society, Oxford University Press, Delhi. Deoras, P.J. 1978. Snakes of India. 3rd ed. National Book Trust, India, New Delhi. Minton, S.A. Jr. 1966. A contribution to the herpetology of west Pakistan. Bull. Am. Mus. Nat. Hist. 134(2):118-119. Whitaker, R. 1978. Common Indian Snakes: A field guide. Macmillan India Limited, Delhi.